Yes, that's right, AP and Honors classes are not included in Maine's Essential Programs and Services funding model and EPS is now also used, since LD 1, as the de facto educational "spending cap." 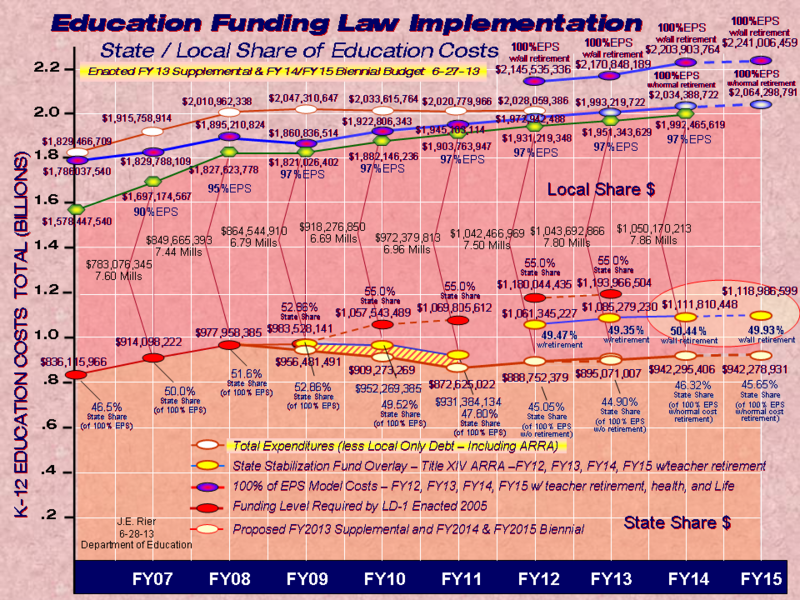 Even well before the last two years' downward tinkering to the formula which was implemented to ease the State's own obligations toward local education, EPS in fact was built to represent the minimum spending necessary to meet Maine's Learning Results. Now both floor and ceiling, the state's educational spending model has been efficiently flattened into a house with no headroom. This allows one of the Governor's departments one day to issue their annual prompt to news outlets to wag their editorial fingers about the profligacy of local school boards and to amplify the need for state-level reforms with more prudent oversight. ...And it then also allows another executive department, the very next day, to follow up this annual budget-season sabotage of local AP-level spending, with a toot on its own horn to take credit, on the local property taxpayer's nickel, for the State's visionary drive toward advanced college-bound learning. Very good. Everyone here gets an 'A', most especially those of you who have to rise annually on the floor of Town Meeting to explain to skeptics in plain English why, despite state-fed news reports to the contrary, the state-mandated boilerplate motion 'to raise and appropriate additional local funds which exceed the State's Essential Programs and Services model' does not, in fact, constitute a recommendation for excessive, reckless, and unnecessary local school spending. Now, let's see how your legislators and newspaper editorial boards do on the same quiz. Brian, AP courses are like any other at a high school. The EPS formula includes money for curriculum and instruction, etc., and in fact has a lower student teacher ratio for the high school level (15:1 as compared to 17:1 at the lower grades) to allow for this kind and other specialized curriculum. There is no money in the formula for AP any more than there is for social studies, math or music. The formula provides funding for curriculum and instruction and districts decide how to use it. There are many school districts that spend at, or slightly above, EPS and have active AP programs. Auburn and SAD 48 both spend exactly EPS; Biddeford, Brunswick, Augusta, Sanford, Scarborough, SAD 4, and others – all slightly over EPS, but not by more than 6 percent – each have strong AP programs in their high schools. The state has also spent more than $5 million of federal money to help start and support AP programs, buy books and pay for tests for low-income students, and has provided professional development for AP teachers for free or at minimal cost. First, thank you for braving our pages to post. I appreciate that you're following MDIschools.net and hope you will find this a good medium for dialog. Many interested educators and legislators look for their information here. So, anytime we can draw a few more facts from you into the soup here, this forum will be richer and better for it. About EPS and AP, I do understand your argument, but I am not yet willing to concede my point. So, instead of being glib, let me instead try being precise. Explicitly an "adequacy" model, EPS is built, maintained, and evaluated only on the basis of its effectiveness in representing the resources necessary, on average, for schools to meet Maine's Learning Results. No less, and no more. It may be that some schools in some areas are large enough to enjoy sufficient opportunities of efficiency that they may be able seamlessly to substitute AP sections in regular class slots without disrupting their EPS student-teacher ratios. But that, it itself, does not demonstrate that the EPS ratios are sufficient to cover AP education generally across the state. To test that hypothesis, you'd have to commission another study from Dr. Silvernail. And I believe I can save the state that expense through applied logic and common sense. Large schools, as you cited, can offer more opportunities at lower unit cost than smaller schools. This is an indisputable reality -- and also, of course, one of the standard arguments for real school consolidation, not just administration reorganization. The EPS ratios allow large high schools in the more populated areas of Scarborough and Brunswick about 80 teachers. 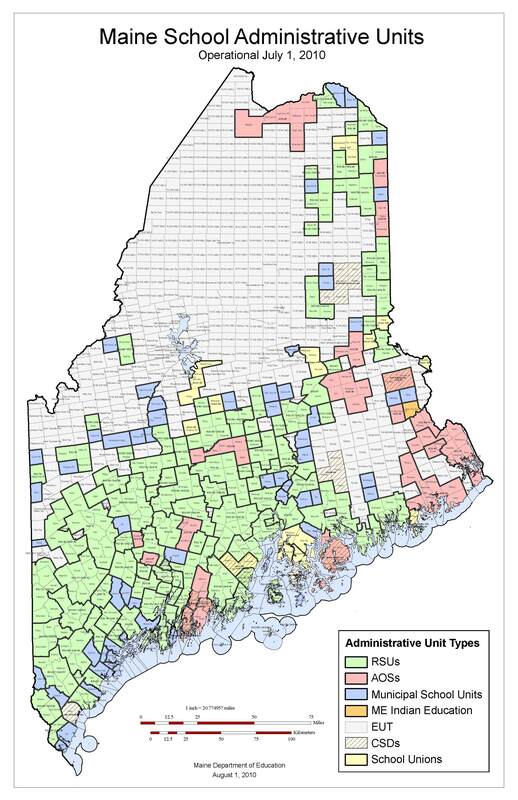 For high schools half their size, such as MDI, it's simply not possible to offer the same range of programs on the basis of an EPS-limited staff of 40. So, to offer the kids of MDI something close to the same equitable educational opportunities they would get in -- say -- Falmouth, we simply hire a few more teachers, have smaller class sizes, and consequently put ourselves over EPS. I understand that the Department of Education does not hold that EPS should represent a ceiling for school spending and that it was LD 1 and not a DoE initiative that now places EPS, most unfortunately, in that function. And the Department certainly should be proud of the increasing participation in AP exams that you're measuring state-wide, and not just in the larger affluent areas. All we out here ask is that, when you annually pass along the school spending data, you remind the State Planning Office with a footnote that that accomplishment is made in many areas at the an expense which exceeds what the EPS formula models as necessary to meet the Maine Learning Results. It's neither black-box econometrics nor rocket science. It's just a matter of fairness to the smaller schools in less populated regions. If it's plain enough for me to get it, I'm certain you do too. I don't know a great deal about AP classes (how they are scheduled, how they are funded and if there are additional funds needed, how students apply and are accepted into the program, etc. ), but it seems to me that in a small high school, there are probably NOT 15 students ready to take an AP class in any particular subject. If that's so, doesn't an on-its-face application of the matrix inherently work against having those classes?